If it feels like everyone is talking about the industrial internet and Industry 4.0, it’s because they are. This first official video in the Internet of Reliability series reveals the most important facts and insights from today’s connected industrial market and lays the foundation for the road ahead. Welcome back, reliability team. You are now in your first official episode of Noria's brand-new web series called “The Internet of Reliability.” I'm your host, Jeremy Drury of IoT Diagnostics, and we're going to be helping you create a connected reliability operation in your plant. Stick with us through all 11 episodes. You may just become an expert in this just like everybody else is trying to become. When we were thinking about all the different episodes and where to start, for us it was most important to ask why. Ask the tough questions. It starts with a state of the market and, perhaps even before that, understanding what the IoT is. What is Industry 4.0? I don't want to make any assumptions for any of the viewers who are going to be joining us as a part of this web series. Some people may be pseudo-experts in this. Some people may just be in discovery mode, but I'm glad that's why you're here. I don't want to get super-deep into the weeds on any of this. It's my hope that with just a little bit of information, I'm going to take you a long way on being able to be that connected reliability leader in your place of business. So, to start, what is Industry 4.0? In the simplest terms, it is this data-driven connected environment of operations. If you go back, you know we've introduced steam and industrial processes into manufacturing. We started doing mass production, and then we got into automation. Now we're getting into this part where it's a step beyond automation, where we're doing connected automation. So, all that means is we know all these processes this entire time have been creating data and all sorts of insights, but we just haven't really understood how to get that information out and make it actionable for our businesses. That's all Industry 4.0 is — how to take existing data, get it out of the processes and the assets, make it actionable and improve your operations. Anything beyond that is too deep, too much. That's it in a nutshell. So, that may not excite you. You still say, “What's the point?” We all know that in reliability, downtime is our nemesis. Slow processes are our nemesis, or anything that takes us away from running a pristine, non-variable-driven operation. With the onset and influx of data and actionable insights that are coming into our business, IoT is going to help Industry 4.0. It is going to help eliminate unplanned downtime. Because if we have important information on asset operations, whether it's pressure, temperature, flow or information that maybe we have not had access to before, we can start to build predictive models to know when an event is going to happen. Most of us probably stream some type of TV. We may have even clicked on a new episode or a new series because a certain provider said, "Hey, you may like this." At some point, someone took data from our viewing patterns and made an assumption and a prediction based on what we would like. And I bet most of us actually liked that show that was recommended to us. That's no different from the industrial side. So, we're basically taking existing operations and making them smarter with predictive algorithms. And this is going to help us to reduce downtime and improve operations. The average statistics say that the standard company’s downtime sometimes can be anywhere from $10,000 to $1 or $5 million per hour of downtime. That's not just an asset being down, but that's time spent trying to fix that asset and loss of production that's happening during that time. It's that compounding effect that we're trying to get rid of. So, where do we go beyond that? When we start to realize how much that data-driven business can start to boost the way that we do business, really cool things start to happen. For businesses outside of an IoT environment, it seems very fortified. For a lot of reasons, we're very protective over the things that we've done to optimize our business practices. But when we get into a connected environment and we invite trusted partners and trusted OEMs into our process — and we all have anonymized data, operating data assisting each other — you'd be amazed how that actually helps grow our businesses, prevent failures and ultimately affect our bottom line. When we think about it for reliability, that's what we're trying to affect. We're trying to improve our bottom line by managing less loss of operating time expenses and everything like that. So, when we think of the state of the market, this isn't small potatoes. This is big news, hence why we're doing this web series. 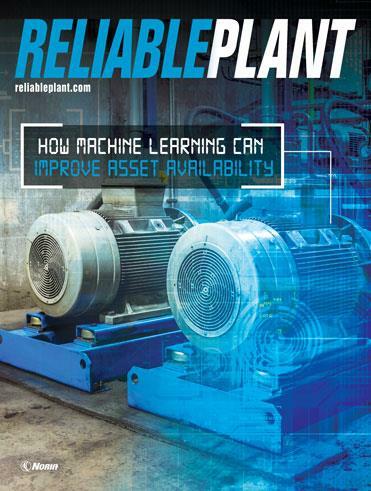 You know this is important for the fact that we would spend our time and resources to help educate you, because for us, this Internet of Reliability, this Industry 4.0, it's not a matter of if it's going to happen, but it's a matter of when it's actually going to take off. We know at this point that it's been challenging. Any type of new industrial build-out is going to be challenging. There are going to be headaches. We've all tried new processes in our plants and our operations, and probably have struggled to get those pushed through. It's really no different with this. I can tell you they are predicting that the IoT market from the industrial side is going to be at least a $50 billion market by 2022. Spending on cybersecurity is going to be upward of $10 billion by 2023. So, everything is trying to work together to make this the right move for all of us and our operations. I'll leave you with one final thought. I was at a recent reliability conference, and I got into an interesting discussion with a reliability engineer. He said, "Jeremy, I have no desire to get into predictive maintenance because I'm still just trying to get a preventive maintenance plan invoked into my operations." I understand the burden that he feels. What I encourage all of you viewers to know is that those don't need to be in lockstep. I personally don't believe that you need to build out your reactive maintenance plan to get to your preventive maintenance plan and then to your predictive maintenance plan, even to your prescriptive maintenance plan. I believe those predictive and preventive plans actually start to work really well together because, imagine again, if you have the access, the insights and the information to help prevent issues from happening, I don't see how those two could be separate. One has a tremendous amount of information that only boosts and bolsters your preventive maintenance operation. So, to me, I call that a copout. That means you're just not willing to take that risk to take a step maybe into the unknown in order to improve your reliability operations. I encourage you if you hang in here for 10 more episodes, I'm going to give you more facts, more strategies and more insights to help build that confidence, so maybe you can take that step in the right direction. Thanks for joining me today. Tune back next week. We're going to be talking more, and we are going to get more specific.